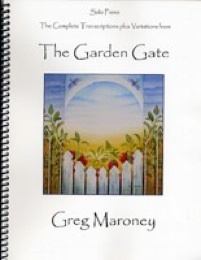 The Garden Gate is the companion sheet music book to Greg Maroney’s 2009 CD by the same name. Greg did the transcriptions himself (and I edited), so these are the sheet music versions right from the composer’s own hands! Because of the improvisations and changes made during performance, not all of these pieces are note-for-note the same as the recording, but they are very close. 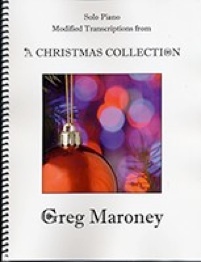 There are thirteen tracks on the CD and the book contains fifteen pieces because Greg was kind enough to offer simplified versions of “Romance” and “Fall,” which are both in C#; the intermediate versions are in C. Maroney is an amazing pianist, so these pieces are not simple, but they are not impossibly advanced, either. Pianists with early-advanced skills should be able to master all of these pieces without much trouble. None of the pieces in this collection have the powerful dramatic impact of “Elementals” or “Nature’s Fury,” but there are a variety of styles and ranges of expression that are a lot of fun to play. I thoroughly enjoyed playing through the entire book last night, and know that this collection will bring other pianists many, many hours of pleasure and years of enjoyment. The book is spiral bound and has a beautiful reproduction of the artwork from the CD on the cover. The music notation is clear, clean, and roomy, making it easy to read. Expression is noted and metronome indications are given. 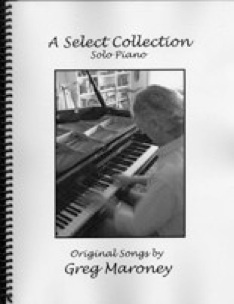 This is an excellent sheet music collection, and I recommend it highly! 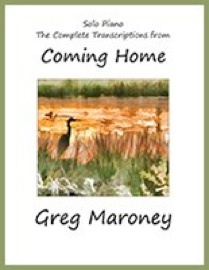 It is available from gregmaroney.com and Amazon.